Overall, women typically earn less than men and take more time out of the work force, which has a significant impact on their lifetime earnings. A woman just starting out will lose $406,760 over a 40-year career, according to a new analysis by the National Women's Law Center. For African-American women, this lifetime wage gap totals $946,120 and for Latina women the losses are $1,135,440. Tuesday is Equal Pay Day, a reminder of the stubborn income inequality between men and women. April 2 marks just how far into the year full-time female workers have to work to make what their male counterparts typically made in the previous year, also known as the gender pay gap. Over time, that discrepancy is magnified. 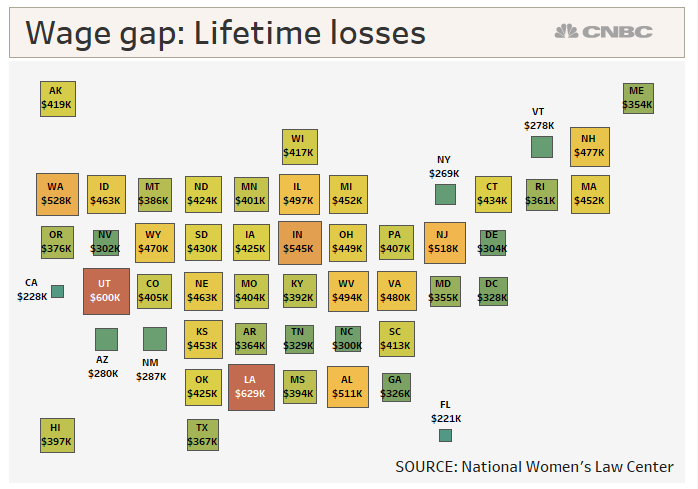 Based on today's wage gap, a woman just starting out will lose $406,760 over a 40-year career, according to a new analysis by the National Women's Law Center. "Women have to work nearly 50 years to make what a man makes in 40 years," said Emily Martin, the center's vice president for education & workplace justice. The pay gap worsens significantly for minorities, particularly African-American women and Latina women, the center also found. For Latina women, the lifetime wage gap totals more than $1 million, and for African-American women, the losses are close: $946,120, the nonprofit advocacy group said. Much of the gap has been explained by criteria such as education and work experience — women are more likely to work part time and take time off over the course of their careers, often to care for children or other family members, according to the Pew Research Center. But there are other factors that are more difficult to measure, such as gender discrimination, which may contribute to the ongoing wage discrepancy, Pew said. To that point, a separate report by Hired, based on real job offers exchanged between job candidates and companies, found that women were offered 3 percent less than men for the same job at the same company, only a slight improvement from 4 percent last year. And, 60 percent of the time, men are offered higher salaries than women for the same role at the same company, according to the job search site. "The wage gap is narrowing but it still persists," said Hired's CEO Mehul Patel.